Parents and families are children’s first teachers. Whether you are guiding and supporting a young child’s development on your own, with other family members or in partnership with child care or preschool professionals, laying a strong foundation in those first five years of life is essential to your child’s continued healthy growth and development. 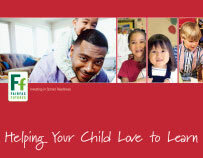 Fairfax Futures has published Helping Your Child Love to Learn in English, Spanish and other languages to introduce you to simple ways you can encourage a young child’s love of learning. The booklet highlights everyday activities that you can use to stimulate curiosity and excitement for learning about the world around us. To promote learning in science, technology, engineering and math (STEM), Fairfax Futures also partners with local early childhood education programs to offer Family STEM Nights. Children and families enjoy engaging in hands-on STEM-related activities similar to those that have been introduced to the children in their classrooms. As a parent, laying a strong foundation in the first five years of your child’s life is essential to his or her continued healthy growth and development.